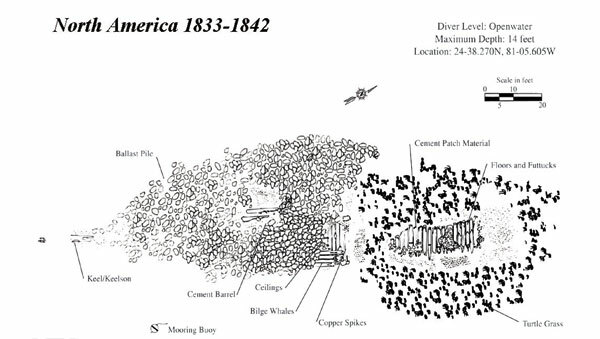 Although not confirmed, this shipwreck may be the North America, built in Bath, Maine, in 1833 and lost November 25, 1842, while carrying dry goods and furniture. She lies in 14 feet of water in the sand and grass flats north of Delta Shoals, just east of Sombrero light. Admiralty Court Records show that a three-masted, square-rigged vessel by the name of North America, carrying dry goods and furniture, was lost November 25, 1842, on Delta Shoals while enroute from New York to Mobile, Alabama. Local wreckers provided assistance to Captain Hall and his crew during a three-day salvage effort. Four ships were registered by the name of North America during this period; however, the size of the remaining wreckage and Captain Hall's name in the court records suggest it may be the North America built in Bath, Maine, in 1833. James B. Hall of New York and George S. Hall of Bath, Maine, were part owners of the North America based in New York. This ship-rigged vessel had two decks, three masts, was 130 feet long, and had a beam of 29 feet. The North America remains consist of a large section of a wood hull filled with ballast. The wreckage measures approximately 112 feet long and 35 feet wide. Only small sections of the lower hull protrude above the sandy bottom and the majority of the structural remains are covered with ballast. The southwest extremity of the site consists of the keel and several iron drift bolts that attached the keel and keelson to the floor timbers. The majority of the remaining hull is mostly covered by sand and only small sections of the keel can be found exposed. The ballast pile is oval shaped and appears to be largely contained within the surviving hull structure. The longitudinal axis of the ballast pile is southwest to northeast and extends for 85 feet. Beyond the ballast the remainder of the hull structure is covered by sand and turtle grass. Click here for a printable version of the North America site map. 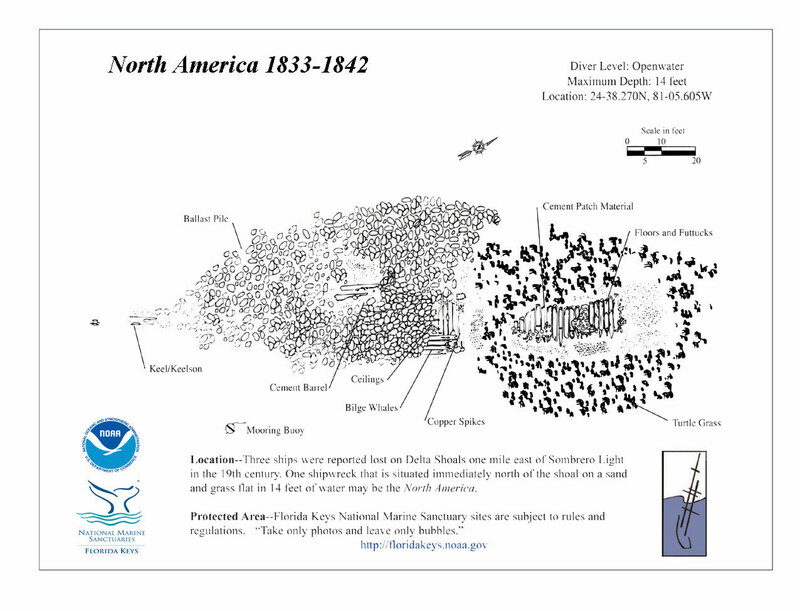 View a map showing the locations of buoys at the North America shipwreck site.